The French are known for formality and politeness and at the table of the French, dining etiquette is absolutely a must. 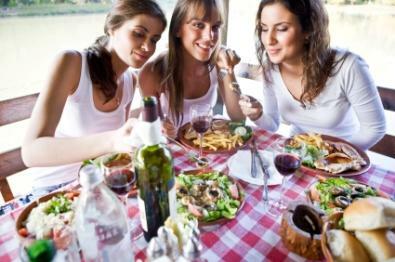 So how exactly do you go about having a meal with your French friends without offending? Keep reading to learn what to expect when dining out or in. Given that the French are so in love with their food and its preparation, it only follows naturally that one must also have impeccable table manners to accompany the fine wine and dining. But be forewarned that what may look like beautiful table manners in America--is not in fact beautiful table manners in France. For some reason, it is very rude to keep your hands in your lap while you are dining in France. It is equally rude to keep your elbows on the table and so the American diner must keep hands visible but elbows not. Also remember that the French almost never eat with their hands. This includes so called "finger foods." Bread will always be served with your meal. If you are dining formally, bread will get its own plate. However, if you have no bread plate, the bread rests on the tablecloth and not on your plate. There is also a manner in which you should eat bread. While most Americans may take a bite out of the bread--the French consider taking a bite out of a whole slice of bread to be rather boorish. Instead, tear off the bread piece by piece. If you are using bread to soak up sauce, use it on the end of a fork. The number one rule in French dining etiquette is to follow the host. If you do this and observe carefully, you will almost never err. This is particularly important when we're talking about beginning to eat, drink or anything else. In general, it is polite to wait until everyone is served and then the host will begin eating. Likewise, if there is an aperitif served, you should wait until the host raises her glass before you raise yours and take a drink. Following the tips above will save you from embarrassment and making too many faux pas. While the rules of eating don't change drastically when you're eating out, there are a few special considerations to remember. In America, the standard tip in a nice restaurant is between 15% and 20%. In France, tips are included. This is a French law so that the tips can be assessed for taxation purposes. You will see a service compris on your bill--which will be 15% of your food. However, one nice thing is that the price of food includes both the tip and the tax. So for example, if you order a piece of cake for $5 and a cup of coffee for $3, your bill is $8--service compris! Who doesn't appreciate an extra tip? While you won't be considered rude for not tipping, it is an appreciative gesture to tip your waiter if he worked well. Something that many Americans don't realize is that the tip that is included in your bill does not necessarily go to the waiters. What's more, the owner of the restaurant can, by law, keep some or all of the tip. So anything additional you leave the waiter goes directly to him. So how much should you tip if you decide to tip extra? There is no hard and fast rule about percentages but if you consider about 5% of your check, this is a nice way to show gratitude to your waiter if he was especially diligent. Eat your breakfast early in the morning when all the boulangeries are open. Eat lunch some time between 12pm and 3pm. Don't plan on much site seeing between 12pm and 3pm. This is standard lunch hour and things will be closed. Plan on a late dinner. If you get too hungry before then, plan early to take a snack with you. The best way to get along in France is to dine and eat the way the French do! Take later lunches and dinners, remember to follow the lead of your hostess and most of all observe the rules of politeness.